I am at the happy position to inform you that the new English edition of my book (3rd Extended Edition, January 2008, 144 pages) is available from the usual bookshops. The book continues to evolve based on the encouraging feedback and remarks I get from readers in many countries around the world. Please note that I am currently working on translating the book in other languages. Thank you for your support and trust in my book. This is indeed a very good instrument in preparing for our competitions. Where can I find this book? Any suggestions please? Good luck with your preparation. 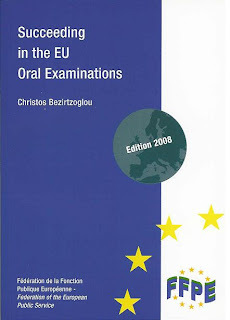 I tried to purchase Succeding in the EU Examinations via the European Bookshop. They claim however, that it is out of print. Any suggestions as to where else it can be sourced? I tried several book stores but they didnt stock it either. Actually the European Bookshop had sold all their copies and that's why last week I had to restock them with new copies. I am a EU_10 laureate of an AD5 competition with international professional experience, living abroad for more than 10 years and still waiting in the reserve list to be contacted by the EC since January 2009. Till now only the laureates who were Temporary Agents and worked inside the Commission and passed the competition like me were hired, they became permanent. I am a little disappointed by the way the EC manages these lists, I studied a lot to pass the exams and then I had to start my lobby, it is like a game without an end. Now I am receiving only polite e-mails in which different Heads of Unit tell me they have no vacancy. May you offer me any piece of advice regarding the recruitment I am here eagering to listen to it. To whom I must write more and more e-mails.. It is nomral that people in reserve lists are not automatically offered a position since the purpose of a reserve list is to actually have a reserve of candidates. Normally these lists have an average life of two-three years. That means that they should be big enough to cope for the needs of the coming two-three years. My advice to you is to send less, but more focused emails. Depending on the competition you passed, you have to target units that could benefit from your competencies. First of all, thanks for your great book. I'm trying to print the reference documents to make the tests. Unfortunately the url are not valid anymore. Is it possible to receive new links for the test 2 to 8? Could you please let me know exactly the book edition and the page number you are referring to? in some of your previous posts you mentioned a 2009 edition of your book. I've been searching a lot online, but can only find ed 2008. Is there a newer one and if yes where can I find it? Is there also an online e-version of the book? Sometimes delivery takes too long.. The last available version of my book is the one that in the cover says Edition 2008. In 2009 we have done a reprint (unfortunately without changing the cover page) and that's the reason why there is a mismatch in some documentation. It costs a lot of money to print new covers every year, as some others' are doing. But then you understand why they have to charge around 40€ per book. Having the best book in the market at such low price is possible just because my staff union (FFPE) is subsidysing it. Finally there is no e-book available. Although we are checking the possibilities. I am preparing for two oral examinations and reading your book was very helpful. I have a question concerning the CV. Apart from the usual information they are asking us to write about different types of skills (social, organisational, technical, artistic and personal). Personal skills are supposed to be "acquired in the course of life and career but not necessarily covered by formal certificates and diplomas". Should I rather refer to my strenghts, skills related to the description of duties, a combination of the two? In my mind personal skills, should refer to skills gained (=strengths)in your social life, but which could be applied to the description of the duties. In example, you studied Japanese poetry, thus you learned Japanese (=a strength), then you apply for a post in external trade (relations with Japan). The end result is that you a candidate with a unique skill (even without been covered by a formal qualification) that nodoby else possess. All the best with the oral exams and do not forget to get us posted of your experiences. Good to see lots of recommendations.